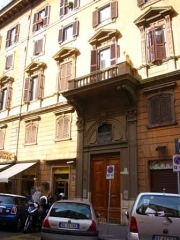 The Bed and Breakfast is located in the Prati neighbourhood of Rome, just a few metres from the Vatican City. The main tourist attractions, like the Spanish Steps, Piazza Navona, Trevi Fountain and Coliseum are all nearby. Ottaviano-San Pietro metro station and a bus stop for bus numbers (19, 23, 32, 49, 70, 81, 180, 271, 490 and 492) are just 50 meters away. A 10 minute stroll away you will find the peaceful tranquil Parco Mole Adriano overlooking the banks of the River Tevere with breathtaking views of Castel Sant’ Angelo and San Pietro Basilica. Prati is also a shopper’s paradise, with its numerous restaurants, pizzerias, cafes, homemade ice parlours, bars, designer shops and fashion boutiques that cater for all tastes within the immediate vicinity. As well as 24 hour cash dispensing banks and currency exchange bureaus, the immediate area is also served by an international cinema, various supermarkets, internet and international telephone points, and various shops that provide all the services imaginable to cater for your every need and requirements to make your stay a pleasant enjoyable hassle free experience. Recently refurbished and named after the famous historical Scipio family, Gli Scipioni Bed and Breakfast has a mixture of both old world charm blended together with a modern art décor. Situated in a traditional 18th Century period building, decorated and furnished in bright colourful tranquil decors with relaxation and comfort in mind. We offer three colourful rooms, Sunrise, Leaf and Fire, with either a twin or double bed facility; two rooms of which also have in addition a double size sofa bed. All rooms have ensuite private bathrooms which include shower cubicle, bidet and hairdryer. Room facilities also include independent controlled air conditioning, thermostat heating, international satellite television, mini fridge, hospitality tray with free tea, coffee and refreshments, writing desk and chair, and storage space. We are a family run establishment that guarantees a friendly courteous service where Romana hospitality is assured to make your visit to the Eternal City a pleasant and enjoyable experience. All our rooms have roomsafes, flat screen LCD TVs and telephones with free unlimited local and national landline calls. An equipped kitchen is available with a fridge, microwave oven and seating area where a self service breakfast is available at our guests’ convenience. Ironing facilities and a children’s sleeping cot are available on request. Rooms are fully serviced daily. Airport, station and local pick up and drop off are available upon request and at an extra cost. From Rome-Termini central station take metro Linea A in the direction of Batistini, exit at Ottaviano-San Pietro station. Upon exiting the station, proceed along via Ottaiano towards St Peter's Basilica. After 30 metres take first right into via degli Scipioni. 20 metres up the street you will find condominium 53 on your right in between the farmacia (pharmacist) and L'Isola Della Pizza restaurant.